El Salvador ( República de El Salvador) is the smallest and most densely populated of the Central American countries, and also the only one without any coast towards the Caribbean. El Salvador borders towards Honduras and Guatemala, and has slightly more than 300 km of Pacific Ocean coast. As the smallest country in continental America, El Salvador has earned the nickname Pulgarcito de America. Data from 2014 show that income from the tourism sector made up 3.5% of El Salvador’s total GDP that year. Tourists mainly come to enjoy the Pacific beaches, especially for surfing. Due to its high degree of urbanization and environmental problems, El Salvador doesn’t offer the same type of eco-tourism for which the other Central American countries are famous. A notable exception are some of the Pacific beaches, where tourists can encounter the Leatherback turtle (Dermochelys coriacea), the Hawksbill turtle (Eretmochelys imbricata), the Green sea turtle (Chelonia agasizzii) and the Olive ridley turtle (Lepidochelys olivacea). There is also El Impossible, a large national park managed by SalvaNatura under an agreement with El Salvador’s environmental authorities. El Salvador has one of the world’s highest murder rates. Widespread gang violence is a major safety issue in El Salvador. In 2001, the United States Dollar became the official currency in El Salvador, replacing the Salvadorian Colón. El Salvador features two mountain ranges that runs parallel to each other, with a central plateau between them. Right next to the Pacific Ocean, there is a narrow slice of coastal plain which make up roughly 15% of the nation’s total land area. El Salvador’s highest point is Cerro El Pital, 2,730 meters above sea level. El Salvador has over twenty volcanoes, with the two most famous ones being San Miguel and Izalco. From the early 1800s and into the mid 1900s, Izalco erupted with such a regularity that its glow became an important landmark for ships off the Salvadorian coast. The mountainous El Salvador is home to over 300 rivers, including the big Rio Lempa which arrives from Guatemala and flows along the central Salvadorian plateau before it cuts through the southern volcanic range to reach the Pacific Ocean. This river generates a large portion of El Salvador’s electricity. 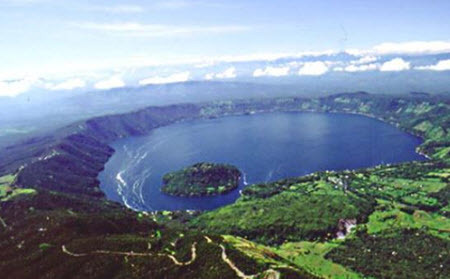 Examples of volcanic craters in El Salvador that have turned into lakes are Ilopango, Coatepeque and Lake Güija. The Pacific plains of El Salvador are uniformly hot, while the mountains and the central plateau have a more temperate climate that also exhibits significant variation depending on altitude. In the extreme northeastern part of the country, snowfalls do occur at high elevations. El Salvador is a tropical country with a dry season and a rainy season. The rainy season starts in May and continues into October. From November to the end of April, the weather is largely dependant on northeastern trade winds that bring in air from the Caribbean. This air typically loses its precipitation while passing over the mountains of Honduras. During the rainy season, the rain typically falls in the afternoon. Thunderstorms are common and usually comes in from the Pacific Ocean. The wettest part of El Salvador are southern-facing mountain slopes, of which some receives well over 2100 mm of rain per annum. Sheltered parts of the central plateau receives less rain than the rest of the country.